Spread one sheet of phyllo in a buttered baking dish and brush with butter. Sprinkle with bread crumbs. Repeat with 7 more layers. Add ½ of nut mixture. Add 5 more layers brushing butter after each sheet of phyllo. Add remaining nut mixture. Add 7-8 more layers. Brush top with melted butter and cut in long strips. Then cut diagonally across the strips to make diamond shapes. Bake at 350oF for 45 minutes. Make syrup with butter, water, sugar, cinnamon stick and one lemon. 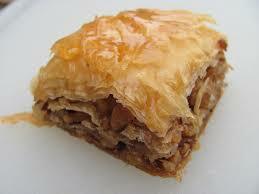 Remove baklava from oven and spoon syrup over while warm. Serve at room temperature. The word “nut” refers to any fruit which is a hard-shelled, edible kernel. Nuts used for culinary purposes, however, also include “seeds” which are not botanically true nuts, and are described as “large, oily kernels found within a shell.” I’ll discuss other seeds, like pumpkin seeds, sunflower seeds and sesame seeds in a future post. Nuts, including the wild almond, prickly water lily, acorns, pistachio and water chestnuts were a major part of the human diet 780,000 years ago. There is evidence that prehistoric humans developed an assortment of tools to crack open nuts during the Pleistocene period. Nuts have been linked to lower cholesterol, better heart health, weight control and lower cancer risk. They do contain a relatively large quantity of calories, however. But they offer unsaturated and monounsaturated fats, vitamins, and essential amino acids. Many nuts are good sources of vitamin E, vitamin B2, folate, fiber, and the essential minerals magnesium, phosphorus, potassium, copper, and selenium. They are most healthy in their raw unroasted form, as up to 15% of the fats are destroyed during the roasting process. Unroasted walnuts have twice as many antioxidants as other nuts or seeds. 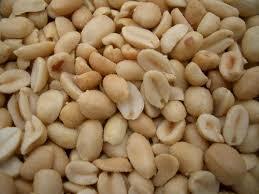 Nuts used for food, whether true nut or not, are among the most common food allergens. Almonds – At traditional Italian weddings, five almonds signify five wishes for the bride and groom: health, wealth, happiness, fertility, and longevity. Almonds, which are edible seeds of drupe (or stone) fruits contain the most fiber and are richest in vitamin E. Twenty years of dietary data collected on over 80,000 women from the Nurses’ Health Study shows that women who eat least 1 ounce of nuts, peanuts or peanut butter each week have a 25% lower risk of developing gallstones. One ounce is only 28.6 nuts or about 2 tablespoons of nut butter. 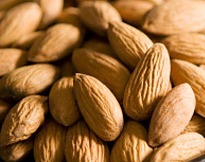 High almond consumption of almonds, however, can interfere with calcium absorption. 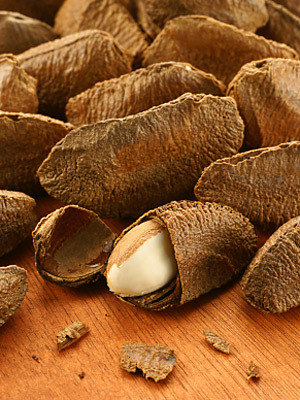 Brazil nuts – Did you know that in Brazil, it is illegal to cut down a Brazil nut tree? Botanically, it is actually a seed. The Journal of Medicinal Food suggests that brazil nuts combined with soy can inhibit prostate cancer by inhibiting the growth of cancer cells. Just one Brazil nut contains 100% of the recommended daily amount of the mineral selenium, which may also help prevent bone cancer and breast cancer. High levels of selenium can be harmful, however, so stick to one serving a day. Chestnuts – Chestnuts depart from the norm culinary nuts in that they have very little protein or fat, their calories coming chiefly from carbohydrates. 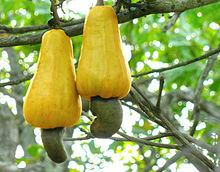 They are the only nut which contains vitamin C, however. In Modena, Italy, they are soaked in wine before roasting and serving, and are traditionally eaten on Saint Simon’s Day in Tuscany. 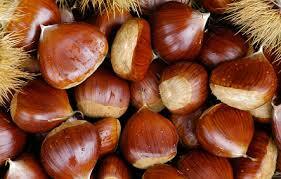 They are not to be confused with horse chestnuts which are inedible because they contain a toxic substance. How do you tell the difference? Horse chestnut trees have “palmate” leaves (multiple leaves on one stem that fan out like a palm), whereas edible sweet chestnut trees have individual alternate leaves. However, edible chestnuts always have a tassel or point on the nut—something that your finger can feel as a point, and the horse chestnut has no point—it is smooth and roundish all over. Hazelnuts – During World War II, an Italian chocolate-maker named Ferrero couldn’t get enough cocoa, so he mixed in some ground hazelnuts instead. Then he made a soft and creamy version and Nutella was born! Hazelnuts are noted for their high level of monounsaturated fats which can improve cardiovascular health and control type 2 diabetes. They are also rich in the antioxidant vitamin E which may prevent cataracts, macular degeneration, maintain healthy skin and reduce risk of dementia. Macadamia nuts – The macadamia nut was discovered by British colonists in Australia in 1857. William Herbert Purvis nurtured them and planted them as seedlings on the Big Island of Hawaii in 1882, where one of his original trees is still growing and producing fruit today. 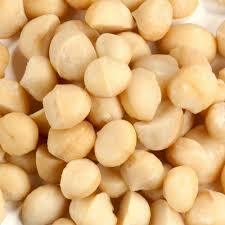 Macadamias are the white kernels of a follicle type fruit. A Pennsylvania State University study found that people who added macadamia nuts to their diets reduced their triglyceride, total cholesterol, and LDL cholesterol levels by 10%. 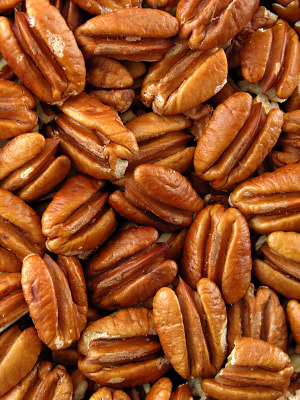 Pecans – The pecan is the only major nut tree that grows naturally in North America. The name “pecan” is a Native American word of Algonquin origin that was used to describe “all nuts requiring a stone to crack.” Early Native American tribes used to produce a fermented intoxicating drink from pecans called “Powcohicora” (where the word “hickory” comes from). A Journal of Nutrition study found that consuming pecans can lower LDL cholesterol levels by as much as 33%. The vitamin E found in pecans may delay progression of degenerative neurological diseases like amyotrophic lateral sclerosis (ALS), also known as Lou Gehrig’s Disease. Peanuts – Eating peanuts at particularly nerve-wracking points during NASA missions is a long standing tradition at their Jet Propulsion Laboratory that dates back to the Ranger program in 1964. Now they eat peanuts on launch days for good luck! Botanically, these “nuts” are small sized, underground fruit pods and are actually legumes. Peanuts contain high levels of a antioxidant that is thought to reduce the risk of stomach cancer and resveratrol, which helps protect against cancers, heart disease, degenerative nerve disease, Alzheimer’s disease, and viral/fungal infections. 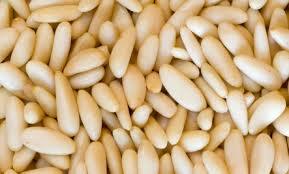 Pine nuts – The effects of pine nuts as an aphrodisiac were well known by the Greeks and Romans. Pliny mentioned them in his book The Loving Arts and a second-century medical practitioner recommended them mixed with honey to relieve “sexual woes.” We are most familiar with pine nuts as one of the ingredients in pesto, along with garlic, basil, and olive oil. Pine nuts are seeds from several varieties of coniferous trees. Pine nuts contain the essential omega-6 fatty acid which triggers the release of hunger-suppressant enzymes and recent research has shown its potential use in weight loss by curbing appetite. They are the richest source of manganese, which helps the body develop resistance against infectious agents and scavenge harmful oxygen-free radicals. Furthermore, pine nuts are one of gluten free tree nuts, and therefore, are a popular ingredient in the preparation of gluten-free diets. 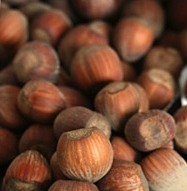 Pistachios – Greece has a long-standing tradition of treating pistachios as exclusively royal food. The pistachio honey cake that is famous for its combination of the nut with honey, is said to have originated in the Greek island of Aegina. Greeks celebrate National Pistachio Day with a festival each year. 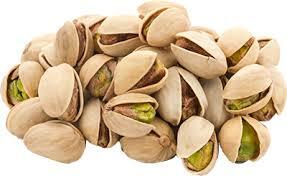 Pistachios are the seeds from a drupe or stone fruit like the almond. The University of Texas M.D. Anderson Cancer Center researchers found that eating just two ounces of pistachios daily may reduce lung cancer risk because they contain an antioxidant that is a form of cancer-fighting vitamin E. They are rich in potassium, essential for healthy nervous system and muscles, and a good source of vitamin B6, which can improve your mood and fortify your immune system. Walnuts – Walnuts have been linked to love and fertility throughout history and their reputation as an aphrodisiac dates back to ancient Greece and Rome. In addition to containing the most antioxidants of all nuts which help protect your body from the cellular damage that contributes to heart disease, cancer, and premature aging, walnuts are the richest in omega-3 fatty acids which fight inflammation. Preheat oven to 300oF. Cream sugar, eggs, oil and vanilla. Add flour, baking soda, salt and cinnamon. Fold in apples and pecans. 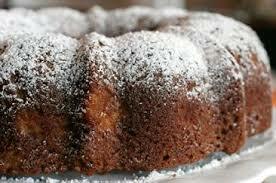 Bake in 2 loaf pans or one bundt pan at 300o for 1 ½ hours. Sift confectioner’s sugar over cake when it has cooled. Apples appear in many religious traditions, often as a mystical or forbidden fruit. For instance, in Greek mythology, the Greek hero Heracles, was required to travel to the Garden of the Hesperides and pick the golden apples off the Tree of Life growing at its center. The Greek goddess of discord, Eris, became disgruntled after she was excluded from the wedding of Peleus and Thetis. In retaliation, she tossed a golden apple inscribed with “Kaliste” meaning ‘For the most beautiful one’, into the wedding party. Three goddesses claimed the apple: Hera, Athena, and Aphrodite. Paris of Troy was appointed to select the recipient. After being bribed by both Hera and Athena, Aphrodite tempted him with the most beautiful woman in the world, Helen of Sparta. He awarded the apple to Aphrodite, thus indirectly causing the Trojan War. In Norse mythology, the apple is linked to eternal youthfulness. Though the forbidden fruit of Eden in the Book of Genesis is not identified, popular Christian tradition has held that it was an apple that Eve coaxed Adam to share with her. As a result, in the story of Adam and Eve, the apple became a symbol for knowledge, immortality, temptation, the fall of man into sin, and sin itself. The larynx in the human throat has been Adam’s apple because of a notion that it was caused by the forbidden fruit remaining in the throat of Adam. There are more than 7,500 varieties of apples. The science of growing apples is called “pomology.” Because apples do not breed true when planted as seeds, grafting is generally used to produce new apple trees. The rootstock used for the bottom of the graft can be selected to produce trees of a large variety of sizes, as well as changing the winter hardiness, insect and disease resistance, and soil preference of the resulting tree. The skin of ripe apples is generally red, yellow, green, pink, or russetted although many bi- or tri-colored varieties may be found. Apple trees must cross-pollinate to develop fruit, and honey bees are most commonly used. About 63 million tons of apples were grown worldwide in 2012, with China producing almost half of this total. The United States is the second-leading producer, with more than 6% of world production. The apple variety ‘Red Delicious’ is the most widely grown in the United States with 62 million bushels harvested in 2005. Commercially grown apples are packed in 40-pound fiberboard cartons (most packers put in at least 42 pounds to accommodate a little moisture loss in shipment). And they are designated by count — the number of apples in each carton. The largest packed size is 48, which means there are 48 apples in each box — a very large piece of fruit. Until the 20th century, farmers stored apples in frost-proof cellars during the winter for their own use or for sale. Improved transportation of fresh apples by train and road replaced the necessity for storage. In the 21st century, long-term storage again came into popularity, as “controlled atmosphere” facilities were used to keep apples fresh year-round. Controlled atmosphere facilities use high humidity, low oxygen, and controlled carbon dioxide levels to maintain fruit freshness. For home storage, most varieties of apple can be held for approximately two weeks when kept at the coolest part of the refrigerator (i.e. below 5 °C). Some types, including Granny Smith and Fuji, can be stored up to a year without significant degradation. According to the U.S. Department of Agriculture, a typical apple serving weighs 242 grams and contains 126 calories with significant dietary fiber and a modest amount of Vitamin C. Many beneficial health effects are thought to result from eating apples; however, two types of allergies are attributed to various proteins found in the fruit. One form of apple allergy, often found in northern Europe, is called birch-apple syndrome, and is found in people who are also allergic to birch pollen. In other areas, such as the Mediterranean, some individuals have adverse reactions to apples because of their similarity to peaches. Apples are often eaten raw, but can also be found in many prepared foods (especially desserts) and drinks. 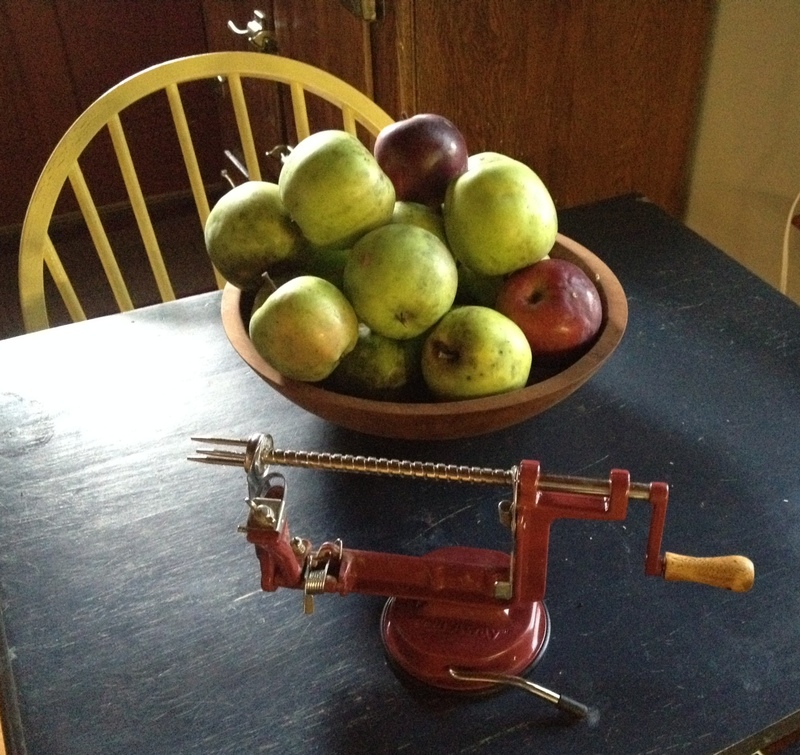 Apples can be canned or juiced. They are often eaten baked or stewed, and they can also be dried and eaten or reconstituted (soaked in water, alcohol or some other liquid) for later use. 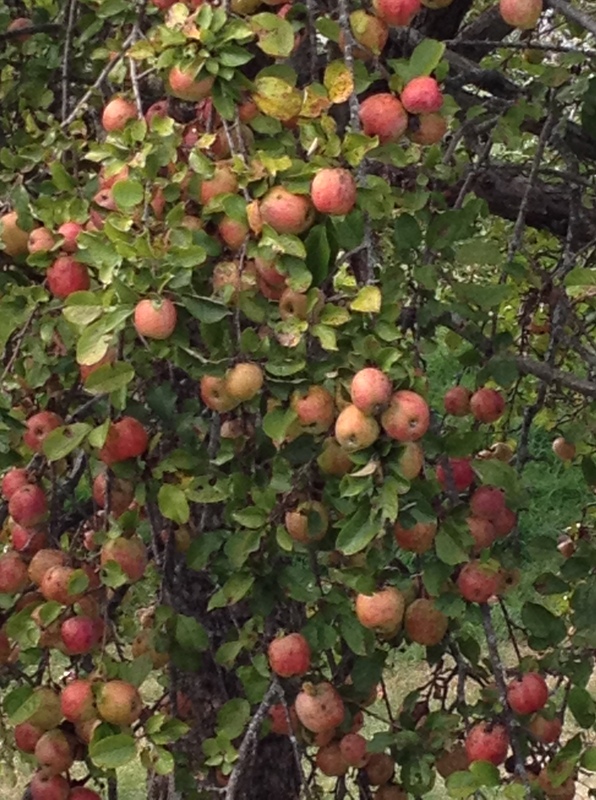 Apples are cooked to make applesauce, apple butter and apple jelly. They are milled or pressed to produce apple juice, which may be drunk unfiltered (called apple cider in North America), or filtered. The juice can be fermented to make cider (called hard cider in North America), and vinegar. Through distillation, various alcoholic beverages can be produced, such as applejack, Calvados and apfelwein. McIntosh and Granny Smith apples are considered the best apples for baking. Jules Janick, James N. Cummins, Susan K. Brown, and Minou Hemmat. “Chapter 1: Apples”. In Jules Janick and James N. Moore. Fruit Breeding, Volume I: Tree and Tropical Fruits, 1999.